The windows around your property do more than shed a little light on your interior. As windows become dirty or begin to degrade they can affect the overall condition of your living or work space. 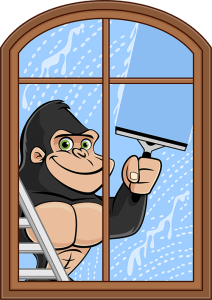 When your windows are in need of a little TLC, let our Gorillas do the dirty work for you. Whether you have a residential or commercial space, trust our Grimsby window cleaning to get the results you need. It is no secret that the exterior of your property is the first impression that it gives to the outside world. Having a clear view inside a storefront can mean the difference between customers and passersby. Instead of allowing dirty windows to make your home or business unappealing, make your Grimsby window cleaning a part of routine maintenance. As windows collect dirt, dust and other materials along their surfaces, they can begin to lose structural integrity. How does this happen, you might ask? Well, although windows are hard on the surface, glass is a porous material. This means that outside elements can seep into the inside of materials. This weakens the strength of the materials, as well as sills and frames, leading to the need for repairs and replacements. It doesn’t matter how many times per year you carry out your Grimsby window cleaning, if it is done improperly. You might reach for that spray cleaner and paper towels with the best of intentions but they don’t yield great results. That is why you should call a Gorilla instead of trying to tackle the issue alone. 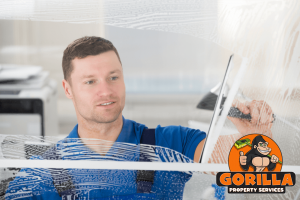 When windows are within reach, our Gorillas tackle your Grimsby window cleaning with rubber tools and environmentally friendly cleaning solutions. By using speciality squeegees, our Gorillas are able to clean out every corner with nothing left behind. If you are more concerned with higher windows, that is not a problem. By keeping a mobile water source on hand, our Gorillas are able to use water-fed poles to reach windows up to four storeys.